Tired of boring workouts at the gym? It might be time to consider some aquatic fitness. A swimming pool is an ideal environment for exercise, and resistance training in water can be a great alternative to stale routines with the same old gym equipment. Plus you get to keep cool in the water and skip getting sweaty. Particularly when the weather is nice and sunny, wouldn’t you rather be building up your muscles outdoors instead of training inside? Better yet, resistance-training performed in water provides a host of unique benefits. For starters, you can get a workout that’s both effective and gentle on your joints. 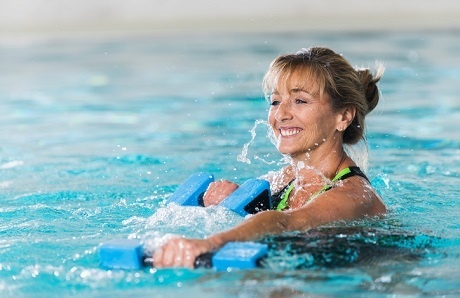 The fluid environment prevents virtually any impact on them, making exercising in a pool a superb option for those with arthritis or other joint conditions. Other benefits include improving blood flow, which means more oxygen and nutrients get delivered throughout your body. Another advantage is recovery: Typically, your muscles will recover more quickly from a workout in the pool versus one on dry ground. One way to get the benefit of a “liquid gym” is by swimming laps for a full-body, cardio workout. The ideal scenario for doing so is in a private backyard lap pool so it’s easy and convenient to keep to a routine. Laps can serve as one component in a a well-rounded fitness routine. But resistance training can strengthen your muscles in a different fashion altogether. Laps will help you increase endurance, boosting your cardiovascular system. However, you can use resistance training to strengthen your muscles. Think of the difference like this: Swimming has effects similar going for a run, whereas underwater resistance training is similar to the kind of results you achieve from lifting weights. If you’re new to aquatic fitness or looking to expand your training regimen, here are five of the best kinds of resistance equipment to use for toning up in a pool. Aquatic dumbbells are a bit different from their traditional metal counterparts found in gyms. On land, heavy dumbbells are pulled down by gravity; that means any exercise that requires the action of lifting them—like a bicep curl or shoulder press—can be difficult. Water dumbbells offer a fun twist on old-school gym weights. Typically, they are made of a lightweight, plastic handle and have foam ends that float. Their buoyancy means rather than being difficult to lift—they want to float. As a result, it’s the action of pushing them down that is difficult under water. By pushing down on these dumbbells, you can work on an array of muscles, such as the triceps, abdominals, and the muscles in your back. You can also use them to work your abs. Stand in water that’s as deep as the top of your stomach, and with bent arms, hold the dumbbells close to your chest. Without moving your legs, try to squeeze your abs and bend forward, pushing your chest and the dumbbells underwater, as if you were doing a sit-up or abdominal crunch standing up. Water fan paddles are handheld plastic tubes with circular, webbed fans on each end. Although not heavy, when you pull them through the water, they create drag—a form of resistance. If you’ve ever opened your hand and tried to swing it through the water like you’re going to high-five someone, you’ve felt this resistance. Fan paddles are a great choice for working your chest, upper back, or abdominal muscles. To do so, use these devices during routines in which you move your arms side to side, rather than up and down. Try a move like this: Spread your arms out horizontally to the side, at shoulder height, palms facing forward. Now clap your hands together in front of you, and then open them again. You’ll feel your chest and shoulders burning in no time. Resistance bands are another great option for your water workouts. You might be surprised how these simple, stretchy cords of flexible rubber latex can take resistance to a whole new level. Use them in a variety of ways to work the muscles of your choice. For example, you can stand in the shallow end of the pool and step onto the center of the bands. Grab each handle on the band to create resistance, and then do bicep curls. To make it tougher, you want to make the band shorter. Either stand with your feet a bit further apart to shorten the amount of band between your foot and hand, or you can wrap the handle around your hand to shorten it. Ultra-affordable, you can purchase resistance bands just about anywhere. Plus, they are equally effective on land, so if you’re looking for versatile workout tool you use both in and out of the water, these bands are an excellent choice. A good pair of ankle weights falls into the same category as resistance bands, creating heavier resistance on your muscles than water alone can. These weights, which wrap around your ankles and attach with straps and Velcro fasteners, work extremely well on both on land and in water. When used on land, your legs will get an intense workout because the weights create extra resistance each time you lift your feet off the ground. However, underwater, the effects become more intense, as you’ll have to fight against the extra pressure created by the water. You can get quite the workout by wearing these in a pool. 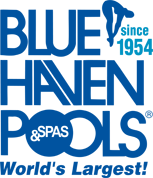 Start by simply walking back and forth along the shallow end of the pool. If that’s too easy, take things up a notch: With each step you take, try bringing your knee up toward your chest. Some styles of ankle weights can do double duty: Take advantage of the greater versatility afforded by a pair of dual ankle and wrist cuff weights, which can also be worn on your arms. The placement on your wrists boosts the resistance level for any move involving the hands and arms—helping you achieve an excellent shoulder workout. For a full-body workout, rotate your moves. Start with a series of leg exercises and switch to your arms—while your legs rest. Then, continue to switch back and forth for a tough resistance workout. If you want to up the challenge of your water workout but aren’t quite ready for something as intense as wrist weights, consider webbed aquatic gloves. They add resistance to activities like swimming and treading water. However, they are not quite as heavy or awkward to handle in the water as weights, which you must be careful not to drop. Gloves allow you to move about in the water as normal, but as you engage in activities such as swimming or treading water, they add more of a challenge. And because you don’t have to hold them, they are easier to use. You don’t have to worry about hanging onto gloves as you would with other pieces of equipment, such as dumbbells. The benefit here is that you’ll have free use of your hands, while still getting an additional challenge. Regardless of which kind of equipment you choose, consistency is key. If you stick with it, you’ll have a great time exercising in the water. Keep in mind that anytime you try a new physical activity, it’s normal to feel a little sore and tired for a day or two after your workout. The good news is that you will likely be far less sore than you would be if you had begun exercising in a gym for the first time. If you keep to a solid workout schedule—jumping in and exercising two to three times a week—you’ll soon get past the soreness and have a great time trying new forms of exercise to keep fit.